ground was very wet as it rained last night. Mr. Robinson was back doing work for Evelina. He was the handyman who, earlier in the year, had spilled varnish on the parlor carpet and taken too long to paint the mantels. Either he was an affable favorite of the family or his price was right, or both, for he was back at the Ames’s, this time painting an upstairs bedroom. Jane McHanna must have been at work, too, keeping busy with meals and chores while she waited for the sun to dry yesterday’s wash. John Swain, the new clerk at O. Ames & Sons, came for dinner. 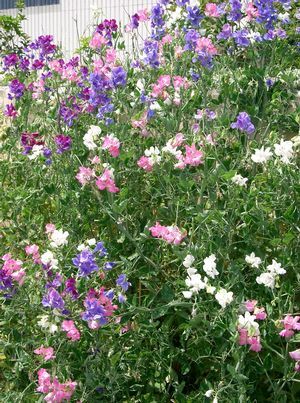 The flowers were fragrant, delicate-looking but hardy, and slow to germinate. Evelina and Orinthia probably placed them in a sunny spot in the beds. Did they need a trellis? Did the ladies wear gloves as they worked, or did they just dig into the dirt? Evelina, at least, probably wore some kind of protection, as she wasn’t at all fond of chaffing her hands.